"A European partnership – building the capacity of Town Planning Associations to plan and deliver sustainable energy solutions"
From 2013 to 2016 the IPI worked closely with other European town planning associations to deliver a unique energy and planning capacity building project to planners and related professions alike. The Spatial Planning and Energy in All Landscapes (SPECIAL) project funded by Intelligent Energy Europe was set up to help bridge the gap between climate change, energy action planning and spatial and urban planning and most importantly, help partner countries meet the EU’s challenging energy and climate change targets for 2020. Working with South Dublin County Council and three other multipliers (Codema, ESB International and SEAI) amongst the outputs of the IPI's involvement in SPECIAL are a number of resources which can be accessed below. Material from the 9 module training delivered by the IPI through SPECIAL is also available below. This Planning, Climate Change and Energy in Ireland guide is part of SPECIAL's competence building programme. It also captures the experiences and best practices models from SPECIAL partners through case study examples. Planners need to have the right skills and knowledge to deal with the challenges presented by climate change. This hands on practical pan-European guide for planners was prepared by SPECIAL, the TCPA and ECTP-CEU and aims to help planners achieve the skills which they will need to maximise their contribution towards a sustainable and low carbon environment. A presentation to the 2016 National Planning Conference introducing the guide can also be downloaded. This valuable resource contains a wealth of case studies and techniques to give inspiration and guidance on the successful integration of spatial planning and sustainable energy across Europe. The five modules in the Knowledge Pool will take you through the type of work that can be achieved for a low carbon future through linking robust evidence-based planning with considerations for implementing sustainable energy solutions. SPECIAL's online Knowledge Pool is available at www.special-eu.org/knowledge-pool. Five expert papers have been produced to further examine key issues highlighted throughout the SPECIAL project. These papers cover topics such as energy and masterplanning, making the connection between energy, transport and urban planning, and the sustainable municipality planning approach. It includes a paper examining South Dublin County Council's Spatial Energy Demand Analysis (SEDA). All five expert papers are available to read and download below. On Tuesday 24th March 2015, the IPI hosted ‘Module 1: An Introduction to Planning & Role of the Energy Planner’. This module introduced architects, engineers and related energy stakeholders to the main functions of the Irish planning system and included an interactive exercise that explored the planning application system in more detail. The workshop included a group exercise exploring a planning application for a mixed use development with energy components. The exercise was facilitated by Dr. Hugh Ellis, Head of Policy at the Town & Country Planning Association. On Thursday 30th April 2015 the Institute held a workshop titled ‘Module 2: The Meeting Point: Energy Planning & Regulation’, exploring the evolution and implementation of national statutory building regulations regarding the conservation of fuel and energy. The module was developed following feedback from multipliers which had indicated that planners in Ireland could benefit from up-skilling in this area, with particular regard to construction projects and issues emerging from meeting the requirements of the building regulations on the ground. On Thursday 28th May 2015 the Institute hosted ‘Module 3: The Departure Point: Mobilising a Response to the Energy Challenge’, which discussed Ireland’s response to climate change through climate change legislation with a representative of the Department of the Environment, Community and Local Government; the legal aspects of climate change legislation from a practicing solicitor and planning the national grid delivered by Eirgird. The module aimed to explore the departure point for addressing the energy challenge and to set the scene for strengthening links between spatial planning and energy in Ireland. On Thursday 24th June 2015 ‘Module 4: The Journey: Developing Evidence Based Policy’ took place in the Morrison Hotel in Dublin. This module explored methodologies for developing an evidence based response to energy policy development, including Local Authority Renewable Energy Strategies (LARES) delivered by multiplier organisation SEAI. Spatially linked Sustainable Energy Action Plans (SEAPs), in in particular energy demand characterisation and mapping opportunities and relationship with spatial planning growth assumptions was also presented by multiplier organisations CODEMA and SDCC. This module drew from the Implementation of Sustainable Planning section of the projects online portfolio. Prof Ulf Ranhagen from the Swedish partner also discussed the Swedish Perspective on Mobilising Municipality Responses to Energy Planning. On Thursday 23rd July 2015 ‘Module 5: The Destination: Implementing Renewable Energy Alternatives’ was delivered in Dublin Institute of Technology, Grangegorman Campus. Participants gained an appreciation of sustainable energy infrastructure in operation in an urban context with a walking tour of the new DIT Grangegorman campus, a vibrant new city quarter with a diverse mix of uses (phased development) on the former St. Brendan's Hospital grounds in Dublin city centre. On Thursday 1st October 2015, Module 6 – Historic Built Environment, Conservation and Energy was delivered in Dublin which focused on integrating current energy standards and strategies into the retrofitting of our historic building stock and how we can learn from best practice examples (using examples from Dublin’s heritage building stock). Masterplanning is becoming increasingly important as a tool to further integrate sustainable energy and spatial planning. There is a recognised need for Planners and related local authority professionals and decision makers to engage with a wide variety of energy issues and stakeholders. The ultimate aim of up-skilling in this area is the addition of climate change adaptation and mitigation, as a robust and evidence based ‘thematic layer’ in the masterplanning and plan making process. Module 7 "Energy & Masterplanning: Applying the Swedish Experience" - of our SPECIAL training programme drew on the Swedish "Sustainable Municipality" and took place on 16th December 2015 and applied it to the Clonburris Strategic Development Zone located in the South Dublin County Council (a multiplier) municipality. The planning process is recognised in EU and national policy terms as having a key role to play in the transition towards a low carbon society. A new National Planning Framework (NPF, a long term strategic plan for Ireland) is being developed to provide the context for national planning for the next decade and beyond. This will involve reshaping and focusing the national spatial strategy to meet today’s and tomorrow’s challenges. The White Paper - Ireland’s Transition to a Low Carbon Energy Future published in December 2015 sets out the actions that Government intends to take in the energy sector from now up to 2030. The paper takes into account European and International climate change objectives and agreements, as well as Irish social, economic and employment priorities. 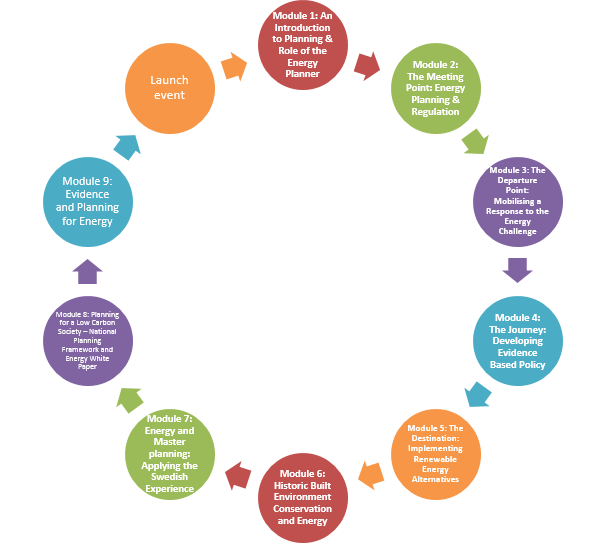 The white paper notes that aspects of energy policy require cross-government collaboration. Examples include climate change, spatial planning, transport, enterprise, and public expenditure. In light of light of the forthcoming NPF and the energy White Paper, Module 8 explored the interaction of strategic planning policy and Ireland’s long term low carbon future. Module 8 - White Paper "Ireland's Transition to a Low Carbon Energy Future"
The final SPECIAL Module 9 workshop on 3rd March 2016 focused primarily on the practices, methods and tools that may be applied in planning for renewable energy including working examples.